Includes the spectacular Mammoth Hot Spring! Gallatin Sheet. Topography Sheet IV. 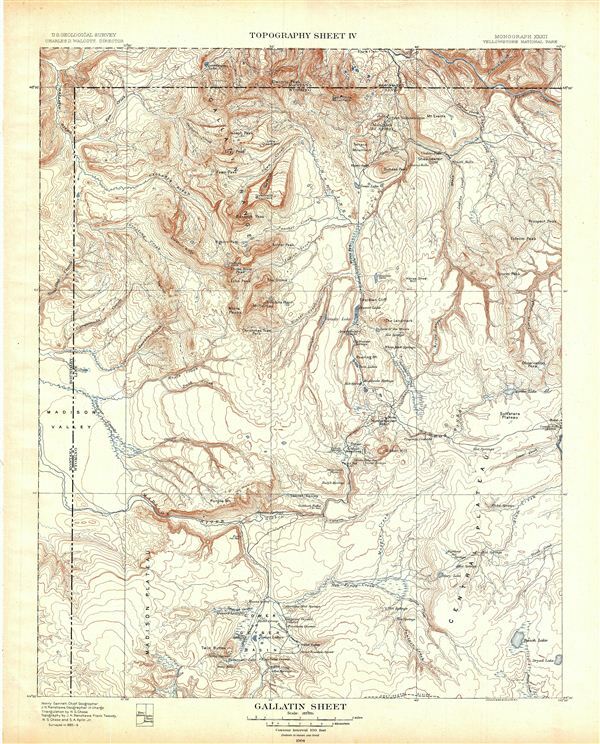 A fine example of Arnold Hague's 1904 topographical survey map of the spectacular Gallatin Region in Yellowstone National Park, Wyoming. Centered on the Gallatin Range, the map covers from the Lower Geyser Basin and Madison Plateau to the electric Peak and the Gallatin River in Montana. Throughout countless well known Yellowstone sites are noted, including Fort Yellowstone, Terrace Mountain, Mammoth Hot Spring, plateaus, rivers, lakes, mountains, creeks and springs. The Gallatin Range, famous for its petrified forests, includes more than ten mountains over 10,000 feet. The boundary line between Montana and Wyoming runs along the length of the map on the left and along its breath on the top. This particular map was part of Hague's study of the regions unique geology and the related geothermal activity. Published by the United States Geological Survey in 1904.